Beta AR Jacket - Mens is rated 4.7 out of 5 by 43. Rated 5 out of 5 by KeithyD75 from Perfect for the Scottish hills! I originally had a Beta AR jacket in XL and to be honest it was huge. I lost weight and downsized to a large which is much better. They are made slightly big. I'm 5'11" and 182 lbs and the lareg is perfect for me. I venture out into the Scottish hills in this every weekend. You can get 4 seasons in one day at any time of the year here so you need the gear to compliment this. I pair the Beta AR with the Alpha SL pant when the precip up's a notch. The jacket I have is a Canadian made one but it doesn't matter where they are made as they are all constructed with amzing skill and precision. Yea, the price is high but you only pay for what you get. Rated 5 out of 5 by Lipton14 from simply the best... I have owned the Beta AR for a little over a year and it is the best fitting, best performing rain shell I have ever had. I am 6'4", 200lbs. and the large fits me perfectly. I have used it in a variety of very wet, very windy conditions and it has performed flawlessly. I have owned the "best" rain shells from Mountain Hardwear, TNF, and others. These jackets don't fit me as well and while they perform similarly to the Beta AR initially, they start having performance issues after six months or so. I am confident the Beta AR will perform exceptionally well for years. This jacket is expensive, but if you consider its quality and the performance guarantee, it is more reasonable. Rated 5 out of 5 by ProHunter from Truly is an 'All-round' jacket I bought my first Beta AR ~5 years ago. Since then the jacket has been dragged across the mountains of BC hunting sheep, exposed to the African sun hunting kudu, and scrapped through the Northern QC forests for Moose. It has survived it all and insured I did as well. It has been worn all year round to protect from sun, rain, snow, and wind. I can't recommended this jacket enough- It can take some serious abuse and not only keep going, but be comfortable along the way. I've now just bought my second as I wouldn't consider another. The Beta AR has become a second skin. My only complaint about the jacket: My first one was made in Canada. My newest is made in China. I wish Arc'Teryx would hire and pay Canadians to make such great gear. Rated 5 out of 5 by Bialosky from The Standard for Over Ten Years It's been quite a while since I bought my first Arc'Teryx jacket, the Theta AR, and with good reason: I never needed to buy another! I wore it beneath pack straps, scraped it across the craggy surfaces of river bluffs and once during a sudden rainstorm used it as an impromptu bag for my camera equipment. Recently, though, I updated by purchasing a new Beta AR and I'm really liking the versatility of its shorter length. I'm 5' 8", 190lbs and the large size provides the right amount of room for layering when it's cold and hits comfortably right around my waist. Here's to another decade of wear. Rated 5 out of 5 by Cam237 from If you need dependable shelter, this is definitely worth the price Thanks to excellent materials, construction and fit, my Beta AR jacket has been virtually impenetrable to rain and snow. I waited several years for an excuse to invest in an Arc'Teryx jacket. That excuse came when I booked 4 weeks of mountaineering in the Peruvian Andes (during the rainy season). I needed something that was light and packable, but that could also withstand a wide range of mountain conditions. This jacket did the trick in a variety of temperatures and precipitation. Really amazing performance. My only issue is that it fits a bit on the short side. My base and midlayers often hang just a centimeter or two below the waistline. Not a big deal, but prospective buyers should bear this in mind given that Arc'Teryx offers jackets with longer cuts. Rated 5 out of 5 by edwardm from the best! i adore this jacket. the fit is perfect. It's light and built right.... pit zips and waterproof. i am 6.1 215 pounds and i have a large. the cut seems to be a bit slimmer than other brands but i can still layer a little. I feel the fit is perfect for me. length is perfect. If you like a longer jacket, they have other models that can accommodate. This jackets been hit by trees and bounced off rocks and it's still in one piece. Still waterproof. Enjoy! As a disclaimer, I am affiliated with Gore for product testing of Gore-tex products for the purpose of product review and recommendation. I do receive items from Gore for these purposes. Rated 5 out of 5 by irueda from Very versatile and excellent customer service I bought this jacket in 2005. I travel all around the world regularly and I always take it with me. It has worked impecably in rain forests, desserts, rock climbing, running under the rain and even snowboarding. After eight years of average usage the bottom gaiter became unglued and some of the draw strings where damanged. I sent an email to Arcteryx and the fixed it for me free of charge!! 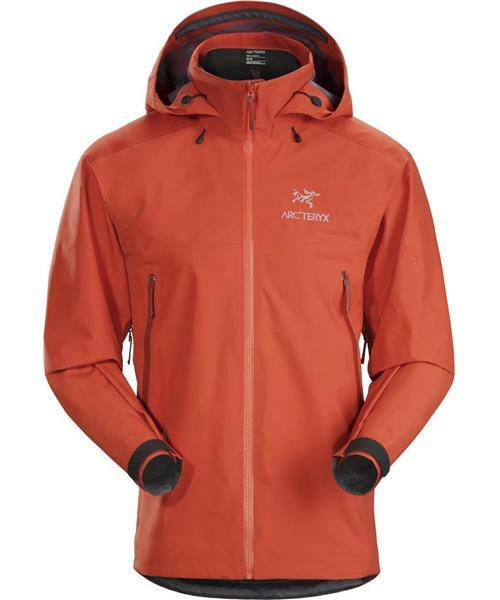 Thank you Arcteryx, definitely worth the price! Rated 5 out of 5 by gearjunky from to helll and back I own the 2004 version of the Beta AR, got it just after Arc'teryx revised the length of it. It has been to 4000 meters , and back. Excellent articulation, hood design, and bombproof construction. It's cut trim, but leaves enough room to layer as needed, I wore a Feathered Friends Volant jacket underneath it comfortably. However there have been times when wearing it in the city that I wished for a bit extra length. I've been looking into a paclite model from Arc'teryx for that purpose. Bottom line, this is the best all around shell, with typical Arc'teryx design perfection. Go get it!